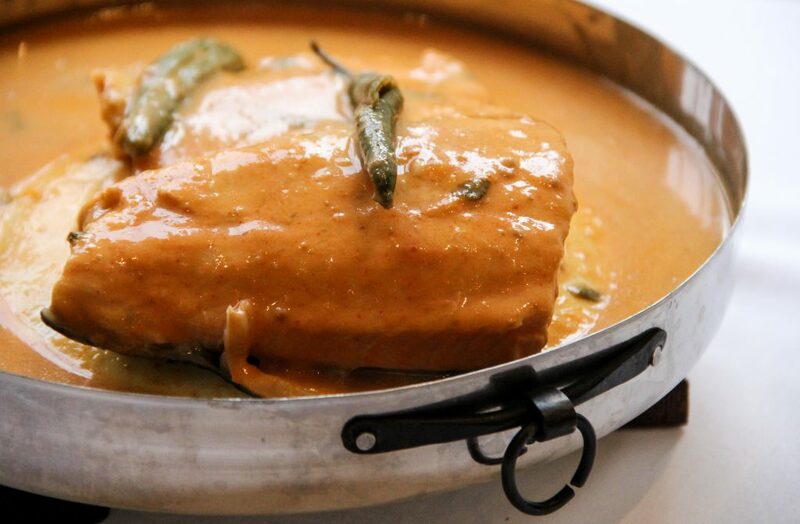 The flavors and aromas of ancient Persia and India converge in Parsi cuisine. 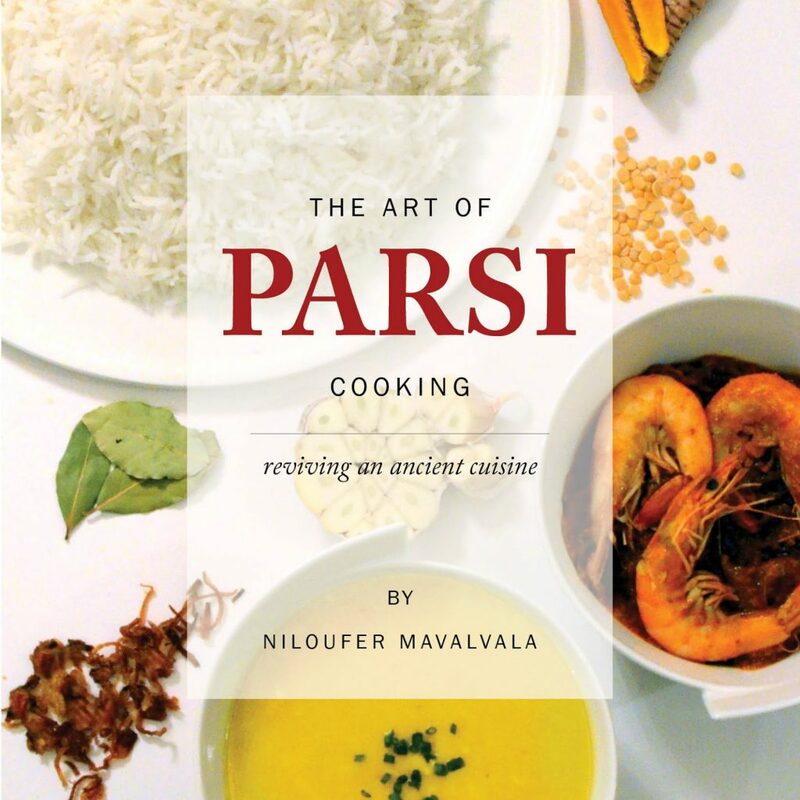 In this exclusive interview, Niloufer Mavalvala, author of The Art of Parsi Cooking: Reviving an Ancient Cuisine, introduces us to the culture and the tastes of the Parsis. JW: Niloufer, thanks for speaking with me about your new title. For our readers who do not know anything about the Parsis, could you share a bit of little history and explain the importance of their journey from what is present-day Iran to India and Pakistan? NM: Prophet Zarathushtra Spitama lived in ancient Persia over 2,000 years ago, and the main keystones of his religion are “good thoughts, good words, good deeds.” After the Arabs invaded Iran in the seventh century CE, many Zoroastrians fled religious persecution and sought refuge in India. The Indians referred to the newcomers as “Parsis” or “people from Pars,” implying that they were “Persian.” As part of the asylum agreement, the “Parsis” agreed to adopt the local language, dress and customs, thereby developing a unique cuisine that blended their traditional dishes with new spices, fruits and vegetables available in India, and later in Pakistan. JW: Cooking classes were an essential part of a young girl’s education when you were growing up in Pakistan. What was it, however, which attracted you to the culinary arts, and why have you remained so enthralled with Parsi cuisine in particular? NM: Having grown up in a family with master chefs and master eaters, we savored all our meals and really enjoyed most of the food put in front of us and my love for good food was inculcated at a young age. Later as I traveled, I could compare the world’s foods to our traditional Parsi food, and although there is an abundance of flavor and texture to enjoy, I seem to be forever enamored by ‘home’ food. I love the spices which make up the bold flavors that this cuisine is built upon. 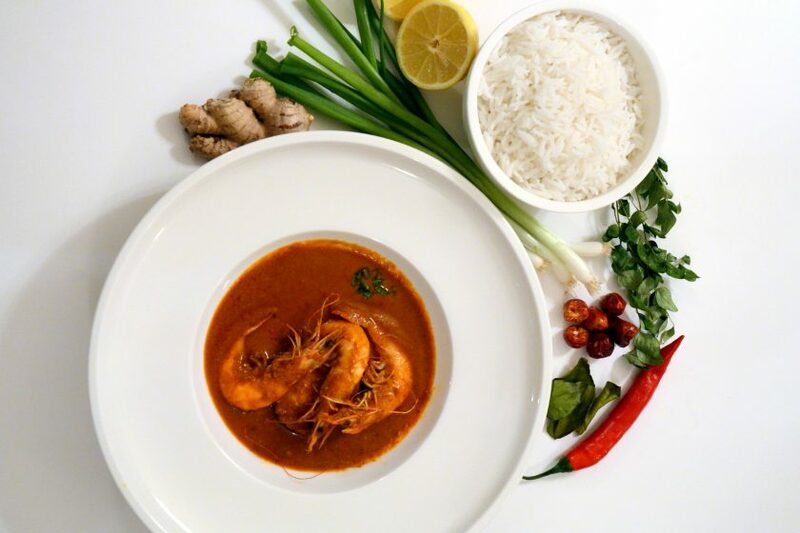 Parsi food to me is all about the fine balance of sour, sweet, and spices (khatu, mithu, thiku). As I continue to cook these dishes, I find new ways to tweak them, either for ease or for additional flavor – as food is ever evolving and the book is about reviving the ancient cuisine – which is exactly what I want to share with the next generation of food lovers. 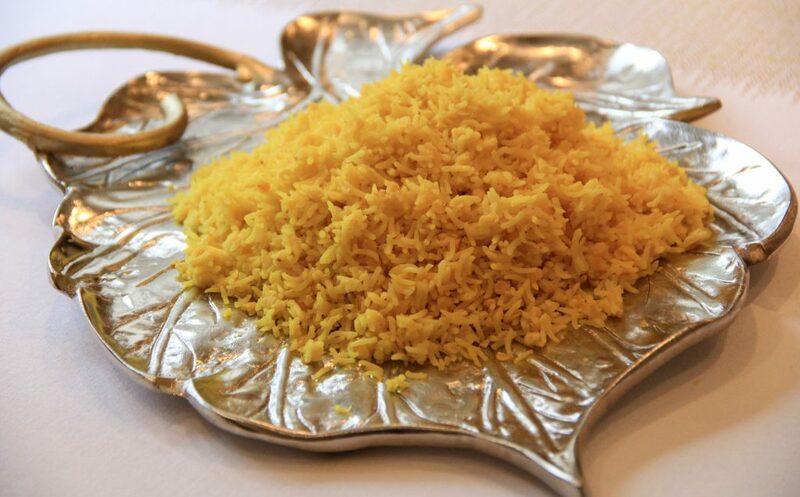 JW: I learned from The Art of Parsi Cooking that there is an emphasis on seasonal foods for health and that healing is an essential part of Parsi cuisine. Why is this the case? Is there some religious or cultural reasoning behind this culinary idiosyncrasy? NM: There is little cultural or religious reasoning behind the emphasis on seasonal foods for health; it is just a reflection of how we prepared food when I was growing up. I do think most traditional cuisines were based on seasonal ingredients and nutrition, so in a way ours is no different. In Parsi food, a lot of the spices have health benefits; turmeric is all the craze right now, but sub-continental cooking has always used it vastly. Similarly, we have ginger and garlic in the base of most of our foods and both herbs have been known for health benefits. We also eat kachumbar — a salad of finely sliced raw onion in vinegar, which happens to help prevent heart disease. I think it is a bonus that our food has some health benefit, as all foods should. JW: We are rapidly approaching the holiday season – are there any recipes in your title that would make for good “holiday fare” in your opinion? NM: Every culture has its own holiday fare. A typical Parsi Menu for an occasion would be a combination of papayta per edu and patra ni Machi, which is fish in Banana leaves and a biryani served with yogurt or spicy lentils (masala dal). The meal would be completed with lagan nu custard. Alternately, a simpler menu is dhun-dar and patia with murghi sali and rewa. JW: Could you tell us about Parsi desserts and sweets? Many accompany meals or cups of coffee or tea. NM: Parsis continue their love affair with a perfect cup of strong tea, while the coffee culture lags behind. Most Parsis have a sweet tooth and are proud to declare it out loud! The key flavors are cardamom, saffron and rosewater. While nuts and milk are the main ingredients in most. Delicious daily puddings are prepared in many homes to complete a meal. 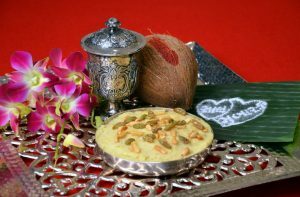 Doodh pak and rewa being the most popular, while lagan nu custard and malido are prepared on special occasions. JW: It has been a pleasure Niloufer! I wish you many happy adventures in research. Please stay in touch and let us know when your next title is published. NM: Thank you James for this opportunity to share my passion with your readers. I hope my book The Art of Parsi Cooking stirs up an interest within the avid adventurous foodie and it helps revive this delectable ancient cuisine. I will be sure to share my next cookbook with you when it is published. 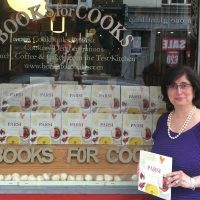 Niloufer Mavalvala outside Books for Cooks in London, UK. Born and raised in Karachi, Pakistan, Niloufer Mavalvala started to bake when she was eight years old, and she taught her first solo class at 17. Soon after she married and moved to Dubai, Niloufer organized frequent cooking demonstrations and classes at her home. In subsequent years, she has gone on to teach many more cooking classes in the UAE, UK, and Canada — where she has lived for the past 15 years with her family. 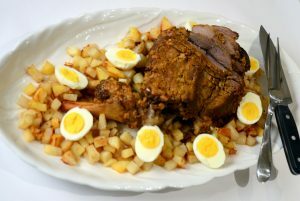 In 2013, Niloufer decided to start a simple recipe blog – Niloufer’s Kitchen – in which she shares old and new culinary creations to hundreds of thousands of visitors from around the world. Author of 10 e-cookbooks, she also writes for the Huffington Post Lifestyle, and an assortment of international magazines and journals. The Art of Parsi Cooking: Reviving an Ancient Cuisine is her latest publication.